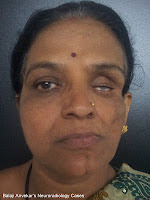 A 54 Year old female with progressive left hemi facial atrophy for last 10 years. 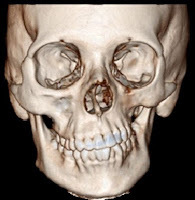 1.Marked facial asymmetry due to bony left hemi maxillo facial atrophy and hemi mandibular atrophy on CT. On MRI Atrophy of left sided medial pterygoid, massicator, temporalis and buccinator. 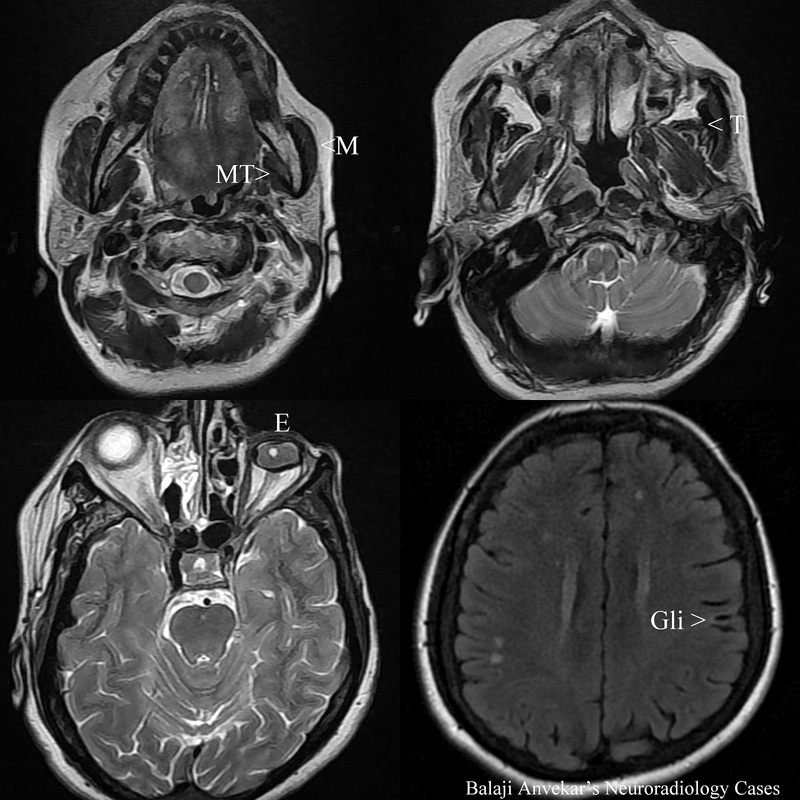 An associated atrophy of left hemi facial cutaneous and sub cutaneous soft tissue. 2.Axial Flair screening of brain shows an associated ipsilateral focal left parietal cortical Gliosis. 3.Left side phthisis bulbi / enophthalmos. An associated left optic nerve and recti atrophy. 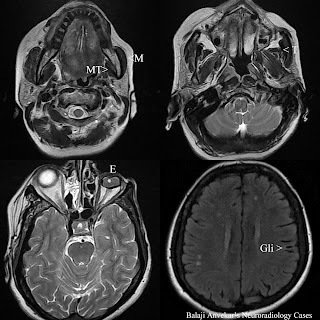 In view of progressive left hemi facial atrophy ‘ Parry–Romberg’ syndrome needs consideration clinically. Syn: Progressive Hemi facial Atrophy. Second time described by Moritz Heinrich Romberg in 1846. A rare neurocutaneous syndrome characterized by progressive shrinkage and degeneration of skin and sub cutaenous soft tissues usually on only one side of the face that is hemi facial atrophy but occasionally extending to other parts of the body. Precise etiology and pathogenesis of this acquired disorder remains unknown. Suggested to be a variant of localized scleroderma with autoimmune mechanism as an underlying cause as affected individual have shown antinuclear antibodies. In some reports more than one member of a family has been affected prompting autosomal dominant inheritance. Other theories are alterations in the peripheral sympathetic nervous system as a result of trauma or infection involving the cervical plexus or sympathetic trunk. Typically appears between 5 – 15 years of age and there after progresses variable course with higher prevalence in females. Usually starts with an area of the face covered by the temporal or buccinator muscles as an atrophy of the skin and its adnexa. Progressively spreads with resulting atrophy with underlying fat, fascia, cartilage, bones muscles of one side of the face. Mouth and nose typically deviated towards the affected side. In frontal region, often begins with a circumscribed patch of scleroderma associated with loss of hair , the appearance of a depressed linear scar is referred to as a "coup de sabre" because it resembles the scar of a wound made by a sabre. In up to 20% of cases the disease may involve the ipsilateral or contralateral adjacent neck, trunk, arm, or leg. In ~5-10 % has been reported to affect both sides of the face. In ~ 45% trigeminal neuralgia and/or migraine. ~10% develop a seizure disorder, seizures are typically Jacksonian in nature (characterized by rapid spasms of a muscle group that subsequently spread to adjacent muscles) and occur on the side contralateral to the affected side of the face. In ~50 % associated ipsilateral brain parenchymal changes noted like focal cortical Gliosis. Enophthalmos is the most common eye abnormality caused by a loss of subcutaneous tissue around the orbit. Other common findings include drooping of the eyelid (ptosis), constriction of the pupil (miosis), redness of the conjunctiva, and decreased sweating (anhidrosis) of the affected side of the face. Collectively, these signs are referred to as Horner's syndrome. The tissues of the mouth, including the tongue, gingiva, teeth and soft palate are commonly involved. In ~50% develop ipsilateral dental abnormalities such as delayed eruption, dental root exposure, or resorption of the dental roots. In ~35% have difficulty or inability to normally open the mouth or other jaw symptoms like temporomandibular joint disorder and spasm of the muscles of mastication on the affected side. Medical : immunosuppressive drugs such as methotrexate, corticosteroids, cyclophosphamide, and azathioprine. Surgical : Microsurgical reconstructive surgery to restore near normal contour to the face. The timing of surgical intervention is controversial; some prefer to wait until the disease has run its course while others recommend early intervention.